This past week an all-white jury listened to testimony at the inquest into the death of Lucia Vega Jimenez while in Canada Border Service Agency (CBSA) custody. During the last month of her life, every institution that Lucia came into contact with was most interested in law enforcement and least interested in her safety. Though this is not shocking to anyone familiar with the immigration system, the facts that are emerging about what happened to Lucia while in custody are illuminating to those unfamiliar with how immigration enforcement really operates. While the inquest has focused on proposals for suicide prevention, better communication between officials, and training for private security employees, it has stayed clear of systemic issues. Lucia’s fears were due to her deportation to Mexico (a country Canada deems ‘safe’ under the new Refugee Exclusion Act), fears she relayed multiple times to numerous authorities. 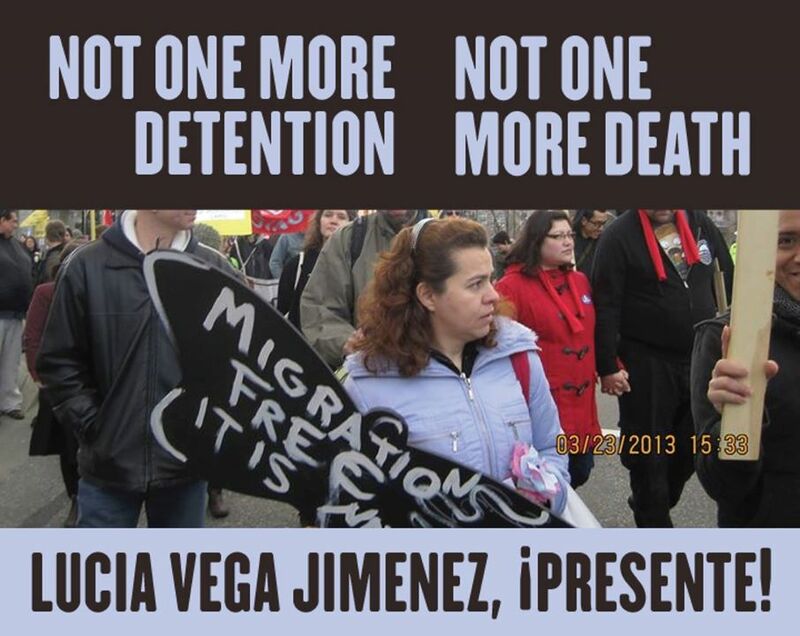 But CBSA does not care for refugees like Lucia; their mandate is to callously enforce deportations. The holding cells below the Vancouver International Airport and Vancouver Public Library are a grim metaphor of the invisible underclass of 11,000 migrant detainees, including children, held in CBSA custody every year. The inquest does not insist on an end to these coercive practices nor does it interrogate the criminalization of migration. 2. Even a RCMP officer who interviewed Lucia’s fellow detainees (who have all since been deported) testified that Lucia appeared visibly distressed and “extremely nervous” to them. Nurse Lilia Hernandes-Cazares testified that she referred Lucia for a mental health assessment and that Lucia showed her scars from violence she suffered. But on the day of the appointment, the computer system mistakenly showed that Lucia was no longer in custody. The appointment with the mental health coordinator was never rescheduled. 3. The Mexican consulate interviewed Lucia several times. They were also to arrange for Lucia to see a counsellor after she told them about her experience of domestic abuse, but they never followed up. Instead, they started to process the Mexican travel document needed for her deportation from Canada. 4. It took Lucia over three weeks to get a lawyer through legal aid, and when she finally got one it was only five days before the filing deadline for a Pre-Removal Risk Assessment (PRRA). It was not CBSA or prison staff or any institutional support, but rather other detainees at Alouette prison that helped her access legal aid. 6. A former employee of the private security company Genesis admitted to falsifying room check records due to chronic understaffing the morning that Lucia was found. Although Lucia was in the shower stall for at least 40 minutes, these falsified records show her as being in a cell at the time. BC Corrections, CBSA and Genesis have already made certain changes at the holding center and prison. Most of the changes have to do with mental health supports. 7. Some are relatively positive changes, such as all mental health referrals from immigration detainees are now marked urgent, underscoring how deportation can itself be a form of psychological torture. Witnesses and participants have been making recommendations on immigration detention throughout the inquest. It remains to be seen which recommendations the jury will make, and, more importantly, if any of these will actually be implemented. 9. There are certain short-term recommendations that are lifelines for detainees. These include better mental health support, shutting down the holding cells below the Vancouver International Airport, free phone calls, access to interpreters, fresh air, free multilingual reading material, and increased legal information. 10. As with so many of the changes that have already been made, a number of proposed recommendations are troubling. These include: increased staffing at the prison and holding center, a longer detention period for detainees to have appropriate mental health screening prior to their deportation, and increased information-sharing of mental health records between agencies. The notion of a more ‘humane prison’ with more staffing (i.e increased management and control of detainees) and better services detracts from the critical question of why an increased number of migrants are being detained and deported, and does nothing to challenge the federal government’s plans of prison expansion (and by extension, prison populations). Although critical, appropriate mental health assessments, for example, would not change the underlying reason for Lucia’s anxiety: her detention and deportation. When detached from an abolitionist and decarceration analysis, prison reform strategies actually, as former political prisoner Angela Davis argues, “render the prison more impermeable to change.” Therefore advocating for detention reform strategies through this inquest must be consistent within the ultimate vision towards ending migrant detentions and deportations. Posted in Immigration. Bookmark the permalink. Just reading the first sentence of this very biased story tells me where it’s going. Why does the writer feel it is necessary to state that it is an all-white jury? Then a quick check on the writer explains a lot. A co-founder of No One Is Illegal. She questions why an increased number of migrants are being detained and deported. Well, does the fact that they have illegally entered Canada have something to do with it? Or does she suggest that we simply open the borders to any and all? And then open the government coffers so these illegal aliens can be given social aid, aka welfare. Maybe she should look a little closer at what she has in Canada compared to what she had in the other countries she lived in.